Everyone has seen people struggling to lug all of their beach gear across the hot asphalt … maybe you’ve even been this person once or twice. With FUNPCB, the beach chair juggling routine is something you can save for parties. 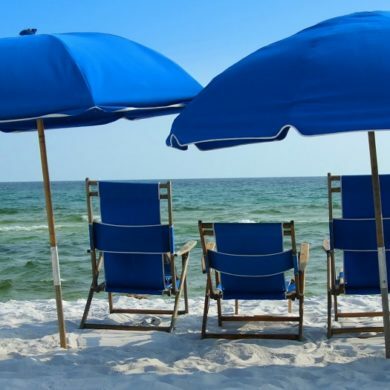 FUNPCB has the chairs and umbrellas ready to go, all you have to do is make a reservation. Why bother renting chairs and umbrellas? Well, with FUNPCB, you’re renting more than just lounging equipment. FUNPCB delivers full beach service along with your rentals. If you’re thirsty, want to move your chair or anything else, just flag down your FUNPCB attendant and he or she will be on the scene. Worried about losing your valuables? With FUNPCB, you can feel confident knowing that your valuables will be safe when you and your group head down to the water for some fun in the sun. Just let your FUNPCB attendant know to keep a watchful eye before you leave. The best part about renting with FUNPCB is, when you’re ready to head in for the day, you don’t have to take anything with you other than your personal belongings and the memories of a fun day at the beach. FUNPCB handles the breakdown of all rental equipment. If you came to the beach with something other than lounging in mind, Aquatic Adventures offers plenty of rentals ranging from paddleboards to sailboats. Just visit the FUNPCB website for a full list of activities. The beach day of your dreams is waiting with FUNPCB! For more information about FUNPCB and the various locations where services are offered, visit the FUNPCB website or call (850) 235-8051.